Property Details: 2 Bedroom, 2 Bathroom Property with approx. 780 square feet. Gulf Shores condo for sale at Surfside Shores. 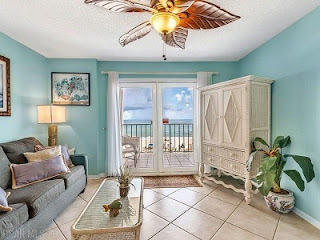 Fantastic updated 2 bedroom/2 bath Surfside Shores unit with stunning Gulf views. Gorgeous granite countertops and tile backsplash in kitchen. Granite countertops in bathrooms. Tile and laminate flooring throughout. Unit accommodates up to 6 guests with queen beds in both bedrooms and sleeper sofa in living room. Great location, great property, great unit - you're gonna love Surfside Shores 1402!